Antalya Airport to Belek Hotels – Belek is one of the centers of Turkey’s tourism industry and is as such home to more than thirty four-star and five-star hotels and many other accommodation, services and entertainment facilities. The town and the surrounding area are famous for their spas and mineral waters received from seven springs. 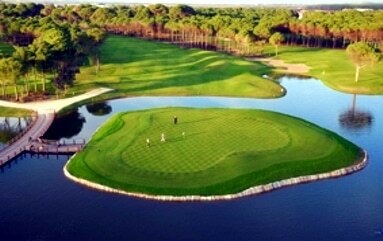 Belek is a developing golf center. Here you will find nice Hotels for your stay. To get from Antalya Airport to Belek, you need a transfer, this will take with a shuttle service 1,5-2 hour and with a private transer 35 minutes. Belek is an upscale resort that attracts an international crowd of holidaymakers looking for an exclusive holiday destination. Visitors will find a choice of upmarket hotels and top quality restaurants, as well as top class golf courses for anyone who wants to practice their swing. The beach here, all 16 kilometres of golden sand and shingle, is the main draw. Surrounded by attractive pine forests and with shallow waters suitable for children, it’s easy to see why it’s popular. The sea is warm and there are a range of water sports, from jet skiing to wake boarding, to try. Shoppers will be pleased to find a Saturday morning bazaar, which takes over the town centre. You’ll find everything from clothes and food to fake designer goods. Come nightfall, the town hums with Turkish-style nightlife. Watch belly dancers and other local entertainment, or head to the nightclub on the beach. If you’re looking for a family day out, look no further than Land of Legends. Here you’ll find a water park, theme park, aquarium and lots of modern shops. There’s even an aerial adventure playground and cinema, so you’ll be spoilt for choice. We offer private Antalya Airport to Belek Hotel Transfers in a air conditioned minibus or coach. The Transfer duration takes 35 Minutes and the price is 33 € for 2 Person you can check all rates here Belek Transfer Rates. You can book your Transfer online and pay uppon arrival to the driver in Euro, USD or Turkish Lira. If you wish more information please contact us. Book your travel offers at our site to all major holiday destinations by coach, taxi or private mini buses. You will experience that how much you can save and enjoy your own private transfer. We have a fast online booking service with friendliest and dedicated staff to work with us. If you want to reach your holiday destination safely, quickly and without any discomfort very affordably then choose us and you will always be there on time. With most economic price our Antalya Airport to Belek Transfer facility is done very effectively. Belek Airport Taxi Transfer, book your private Antalya Airport to Belek Transfer online and pay upon arrival to the driver.